The year 2007 was a watershed year for me in regards to my development as a filmmaker. For starters, it marked ten full years that I had been making films– I was only eleven when I trained a video camera on my action figures and made a stop-motion movie with them. 2007 also saw the year I shot and completed THE ARCHITECT, my thesis film that would cap my studies at Emerson College. And finally, the top three films of the decade (a opinion shared by many besides myself) all debuted within a few months of each other during 2007. 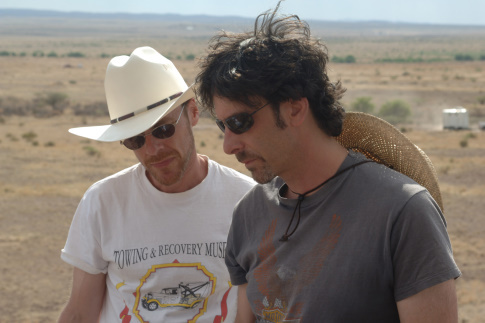 These three films– David Fincher’s ZODIAC, Paul Thomas Anderson’s THERE WILL BE BLOOD, and Joel & Ethan Coen’s NO COUNTRY FOR OLD MEN– left an indelible mark on me, and have influenced and informed my work ever since. It was the closest that I felt modern-day Hollywood has ever gotten to my favorite era of cinema– the 1970’s– and the success of these films suggested the dawn of a new age of artfully-made films. Sadly, this was not meant to be. Only a year later, the specialty studios that made these kind of prestige films– Warner Independent, Paramount Vantage, New Line, etc– would shutter, paving the way instead for the dominance of big-budget, rudderless spectacle films, remakes, sequels, and prequels. I had the pleasure of interning at Warner Independent Pictures in its closing days, and it was heartbreaking to see the house collapse in on itself. The studio executives I worked with were the complete opposite of your archetypal Hollywood producer: they were unbelievably kind, had great taste in scripts, had little regard for the box office results of their work, and genuinely desired to create great movies. And in the great American tradition of capitalism, all their hard work was rewarded, not with bonus checks, but with pink slips. It was a short, glorious era for filmmaking, and as a budding filmmaker who had recently made the big move to Los Angeles to finally start his career in earnest, it was an incredibly exciting time. Walking around the Warner Brothers lot on my lunch break, I felt like anything was possible. My optimism was countered by the pessimistic nature of these three films. I once read somewhere that periods of war and controversial presidencies often influence pop culture to ask tough questions and reflect the somber view of reality. It was certainly true for the 1970’s, quagmired in Vietnam. It was also true for the Bush administration, which was losing two wars and slipping into the worst recession in nearly eighty years. For many, it seemed like the world was ending, and this pessimism bubbled it’s way to the surface, channeled into our art as a coping mechanism. It’s into this climate that the Coen Brothers released NO COUNTRY FOR OLD MEN. Adapted from the Cormac McCarthy novel of the same name, the film stunned audiences into a dumb silence, almost as if they were bludgeoned by some blunt instrument. I had caught the film during my last days of living in Boston, and it felt like nothing short of a revelation. NO COUNTRY FOR OLD MEN is undoubtedly the Coens’ masterwork, rightfully rewarded with their biggest box office take at the time, as well as golden statues for Best Picture, Best Director, Best Actor, and Best Adapted Screenplay at the Academy Awards. It was a perfect synergy of the cultural zeitgeist, the Coens’ unique directorial style, and the national mood. The film’s tagline, “you can’t stop what’s coming”, proved to be true on untold levels. Its success was an unstoppable juggernaut, and its barren, desert setting hinted at the economic wasteland and devastation that, much like the terrifying specter of Anton Chigurgh and his fateful coin, was traveling from some unknown place to arrive at our front door. NO COUNTRY FOR OLD MEN concerns a briefcase full of money, and the wrath it incurs on those who possess it. A gruff man, Lleweyn Moss, comes across it when he finds the aftermath of a drug deal gone south. He takes it back home with him, only to learn that its original owners, a dangerous gang of Mexicans, are after him to take it back. Meanwhile, a fundamentally unsettling assassin known as Anton Chigurh (Javier Bardem) is relentlessly stalking closer to Moss, also in pursuit of the briefcase. He kills anyone who gets in his way, utilizing a variety of macabre techniques: strangling a police officer with his handcuffs, using an air-powered bolt pistol to punch holes in the head of unlucky fellows, or savagely gunning down Mexican gangsters with a silenced shotgun. One step behind both players is Sheriff Bell (Tommy Lee Jones), a weary police officer who, in his old age, has become deeply troubled by the realization that existence could be meaningless. These three figures pursue each other across the Texas countryside, and their encounters with each other will change their lives forever. The calibre of acting talent on display is simply staggering. Although Bardem was the only cast member to be nominated for an Academy Award, Jones and Brolin are just as eligible in their respective turns. Sheriff Bell was the role that Jones was born to play– both men hail from the same area of West Texas, and Jones imbues his aging lawman with a haunted, wanderer’s soul. As he enters his twilight years, spirituality is beginning to enter his life– but not like he imagined it. What he expected to be a sudden swelling of faith in Jesus Christ instead gave way to a philosopher’s forlorn musings on a world where human life is snuffed out as inconsequentially as if it were a household fly. It’s a towering performance by Jones, one that reminds us why he’s one of the best actors working today. Brolin, who before this point was a relative unknown, found his career kicked into high gear after having to fight to secure the role of Llewelyn Moss. His performance is gruff, quiet, and tough– but he doesn’t take himself so seriously that he’s one-note. Moss is a stubborn man who thinks he can outsmart the unstoppably evil force that draws closer, but he must pay the price of his hubris with his own blood. Another unknown to US audiences, Javier Bardem was a pants-shitting revelation the minute he stepped on-screen with that unnervingly creepy haircut. As Anton Chigurh, he’s one of the most indelibly terrifying monsters in cinematic history, right up there with Dracula or Heath Ledger’s Joker. He’s whip-smart, efficient, and deadly quiet. When he speaks, the low monotone timbre of his voice suggests nothing less than Lucifer incarnate. It was a hell of an introduction for Bardem, easily netting him the Best Actor Oscar that would kick off one of the most acclaimed careers of any actor ever. The supporting cast is equally great, starting with Woody Harrelson as Carson Wells, a dandy bounty hunter tasked with finding Chigurh and the briefcase. Harrelson’s screentime is brief, but his casual drawl and relaxed tough-guy attitude makes for a highly memorable appearance. Kelly McDonald, a pretty Scottish actress, defied any doubt about her ability to portray a timid Texan girl with her performance as Moss’s wife, Carla Jean. She pulls off a heavy West Texas accent effortlessly, and her feminine presence is a welcome relief in a film that is otherwise dominated by brutal machismo. NO COUNTRY FOR OLD MEN is unique in that almost none of the Coens’ regular actors make an appearance in the film, save for Stephen Root. Root makes a brief cameo as a big-city boss that hires both Wells and Chigurh, only to find himself on the receiving end of Chigurh’s silent fury. Root plays his character as appropriately sleazy, but it never feels over the top or out-of-place within the stark tone that the Coens have cultivated. Roger Deakins, serving once again as Director of Photography, effortlessly creates one of the Coens’ best-looking films. The 35mm film image, limited to a 2.35:1 aspect ratio so as to give the film a bigger cinematic punch, is spare and stark. Highlights are blown out, suggesting a place where hard men toil under the intense beating of a vengeful sun. Colors are desaturated to reflect the arid desert climate that surrounds them, and blood (of which there is a copious amount) stands out as a creeping, dark crimson fluid that stains the earth and seeps into cracks in the floorboard. The Texas nights are as hot as the days, represented via warm amber tones in place of the more conventional moonlight-blue. The austerity of Deakins’ images are complemented by reserved camerawork that uses imperceptibly slow, creeping dolly shots that add an air of foreboding and malice to slow-burn suspense sequences. For their twelfth feature film, the Coens bring on a new Production Designer in the form of Jess Gonchor. Like Dennis Gassner before him, Gonchor creates a tangible world for McCarthy’s characters to inhabit. West Texas in 1980 is a dusty, color-less place that’s still somewhat stuck in the decade that preceded it. Walls are wood-panelled, motels are dingy, clothes draw from the earth tone palette that defined fashion in the late 70’s, etc. Speaking of music, NO COUNTRY FOR OLD MEN is infamous for its lack of music throughout the entirety of the film. Carter Burwell, the Coens’ regular music man, is credited for his score, but you wouldn’t know it upon a cursory listen to the film’s soundtrack. Burwell’s score does exist, albeit in a radically imperceptible way. Comprised mainly of ambient tones, it buzzes low under select sequences, giving a palpable ominousness to them that registers on a subconscious level. It’s an effective approach to score, especially for a film that already achieves such a powerful atmosphere without it. The only blatantly musical notes we hear come in the diagetic form of a mariachi band that plays over Moss as he wakes up wounded in a Mexican town square. NO COUNTRY FOR OLD MEN ironically finds the Coens working in top form, while simultaneously adopting a stylistic approach markedly different from their previous films. Many of their directorial signatures— beginning the film with a regionally-accented voiceover musing over establishing shots of the setting, traveling point of view shots, and wry humor– are all present, to varying degrees of subversion. The violence is sudden and brutal (and often occurs offscreen), as it always has been with the Coen Brothers, but there’s considerable more malice this time around. The image of a storm of scuff marks on linoleum– the aftermath of a savage murder by strangulation– is haunting by the slow, torturous death said marks imply. Quirky Coen characters abound, but they’re grounded in the harsh, sun-baked reality that the story demands. If their fondness for influences like Buster Keaton and Preston Sturges were evident in their previous films, NO COUNTRY FOR OLD MEN finds the Coens swinging towards the other side of the pendulum, channeling the likes of John Ford and Sam Peckinpah. An air of pessimism abounds throughout the film, implying a weary hopelessness to life that can only be soothed by a woman’s grace. Thematically, NO COUNTRY FOR OLD MEN’s nihilistic viewpoint has much in common with the Coens’ previous masterpiece FARGO (1996), as well as their pitch-black debut BLOOD SIMPLE (1984). It’s interesting to note that the Coens’ biggest cinematic successes have been when they indulge in darker subject matter. For all their worth as intelligent tricksters and comedic stylists, perhaps their greater voice is that of documentarians of our own inhumanity towards each other. NO COUNTRY FOR OLD MEN is an unmitigated highlight in the Coens’ development as filmmakers. The stripped-down aesthetic allows them to channel the best of their craft into the proceedings, making for an unforgettable experience. The Coen Brothers are lucky enough to have a great deal of films that they’ll be forever remembered for, but NO COUNTRY FOR OLD MEN stands above them all as a staggering achievement. It is one of my personal favorite films of all time, inarguably one of the very best films of its decade, and a reference-grade masterwork that raised the bar for all filmmakers to come. NO COUNTRY FOR OLD MEN is currently available on high definition Blu Ray from Miramax.